I mean, what with that awful combination of title and subtitle, one that offers any number of red flags—not the least of which is the specificity of the dates, something that implies there may be another volume with diary entries from 2003 until present day—worry sets in as the reader cracks the volume. Then there’s the whole concept of an author publishing his diaries himself. Most—and here I pause to recommend The Noel Coward Diaries, which is perhaps the very best of this sort of volume—are published after the author-in-question’s passing, collected and edited by a third party whose job it is to extract the very best bits of what is likely to have been years worth of verbal bric-a-brac into something insightful, entertaining, even scandalous, while in no way libelous. As such, they often represent the bottom of the barrel in terms of a given author’s output, in that they were created not for public consumption, but instead as a source of remembrance for the author, and very often as a means of putting pen to paper in a manner not unlike computer software undergoing several beta stages before arriving at a finished form. Thus, the conversations recorded, anecdotes committed to print, may find their way into becoming short stories, song lyrics, and/or bits of dialogue that will one day be found in Act II of something staged. At their best, diaries that have been well edited display the evolution of a given author (or other notable) in terms of their artistic as well as their personal growth. At their worst, they are vapid things, mirrors held high by the egotistical, pellet guns waved about by the vengeful. “’Who are you talking to?’ he’d ask. And in that the author himself is doing the edits, the “conversation” is made most notable by the selections themselves, by the dates that are chosen among the many that were cast aside (156 volumes, remember? ), as well as by the edits that allow for the punch lines—and there are many—to pay off. I’m not quite sure on what specific date Sedaris transitions from seeing his diary as a sort of forced march and begins allowing it instead to be a gathering of pictures from the exhibition that is his own life, but by the end of this collection of entries, the reader feels not only that he has been treated to an illustration of the evolution of an author—sort of like the one with the tadpole crawling out on land and, with legs, clubs and animal pelts, ending up as modern man—but also as an autobiography of the sort that, given its utter honesty, most of us are incapable of writing. In this layered, chunky diary-as-memoir, there are several types of entry, each of which is repeated again and again. Others are simple historical markers that allow the author and reader alike to remind themselves of just where we are in human history. 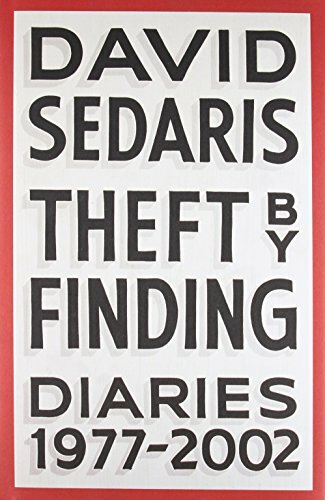 More entertainingly, Theft by Finding contains any number of nodules of the sort that only David Sedaris seems capable of finding along the path wending through everyday life. Perhaps this entry is more important than others in that in revealing our author’s respect for those working with what they have, it also reveals the source of the author’s humor. He is, after all, in his way, doing the same. But like a book-length “It Gets Better” ad, Theft by Finding shows that, for Sedaris, bit by bit, with a move to New York City and some success, and after finding Hugh, who would become his husband, things do indeed improve, as well as that some degree of fame and some bit of fortune do indeed buffer against the worst things in life. The contents of Theft by Finding make the reader yearn for more. Not for the diary entries from 2003 through 2017, but instead for the wonderful novel that David Sedaris has lodged inside of himself. The one that will have to be a movie and then a musical and then a sitcom and finally an HBO miniseries that allows for the full blossoming of the novel into another medium at last.